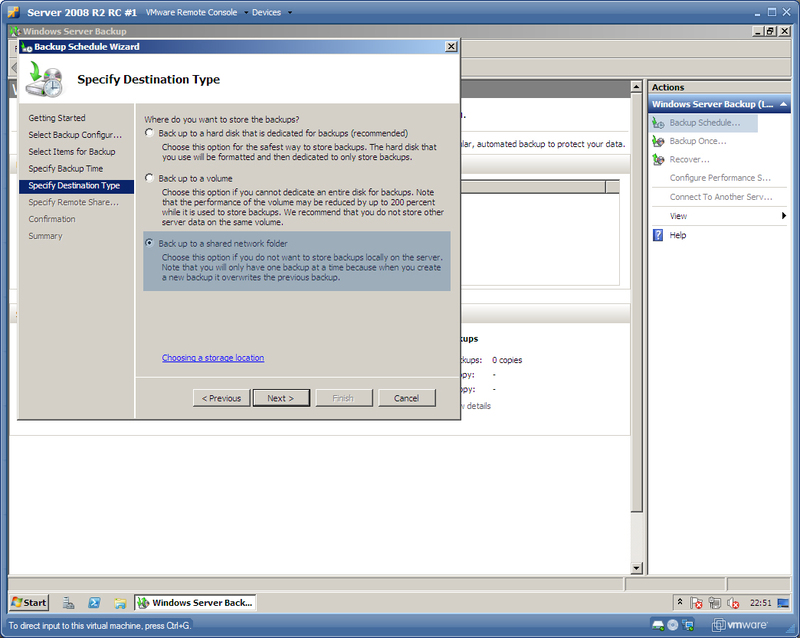 The upcoming Windows Server 2008 R2 has a wealth of new features and improvements over the original 2008 release. 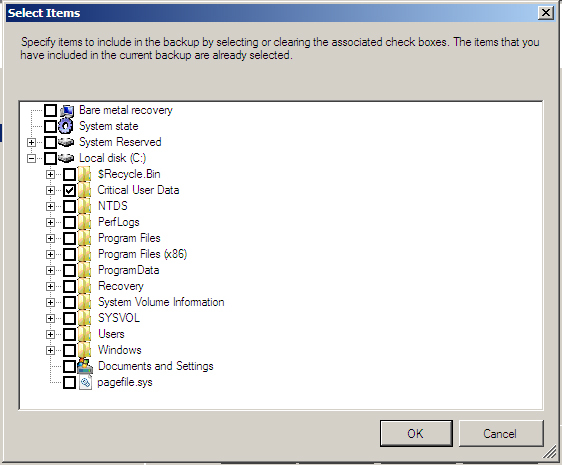 One such improvement is in the built-in backup tool, Windows Server Backup. In the early Windows 2000/2003 days, Microsoft's entire line of products included a basic backup utility called NTBackup. This tool allowed administrators to configure simple backups for their servers, and was aimed primarily at those deploying servers in small to medium-sized business environments. It included technologies from Veritas, the company who originally developed Symantec Backup Exec. The original release of Windows Server 2008 sparked an outcry when it was discovered NTBackup was replaced with a new Microsoft technology, Windows Server Backup. This tool was both an improvement and a set-back in backup technology; it supported backing up to Virtual Hard Disk (VHD) files (which can be mounted by Microsoft's Virtual Server or Hyper-V for recovery of data), but it didn't have support for backing up individual files/directories, or for backing up to a network share using its Graphical User Interface (GUI). Workarounds were available for continuing to support NTBackup on this OS, but they were not supported. Windows Server Backup now has support for configuring a scheduled backup to a network share via the GUI. Previously, you were required to run a manual batch command to use this feature -- which led to a loss of fidelity in your backup procedure. As shown in the screenshot, the 'Backup Schedule' wizard, linked from the 'Actions' pane to the right of the backup console, now includes this much awaited 'Backup up to a shared network folder' option. Unfortunately, functionality has been improved but there has been no improvement if you were intending to deploy any advanced backup programme which retains multiple copies. Selecting the Shared Folder option in the wizard prompts a warning to appear, indicating you can only store one copy of a shared backup when placing them on the network. This is a significant difference to harnessing the built-in backup-to-disk technology, where multiple backups are kept and only overwritten when the disk is full. Many companies deploying network backup are doing so as part of a larger backup scheme, which may later duplicate the backup to tape or hard disk for off-site storage. Anyone deploying shared network backup via this technique as their main backup should remember that it will allow a full server recovery, but won't help in situations where documents created and destroyed 3 weeks ago need to be recovered; they will long since have been overwritten. The original Windows Server Backup release only allowed the backup of server volumes - it was not possible to be granular in what files or folders you wished to backup. In 2008 R2, NTBackup support for specifying individual files/folders has been restored -- for both once-only backups (started using the 'Backup Once' command and for scheduled jobs. 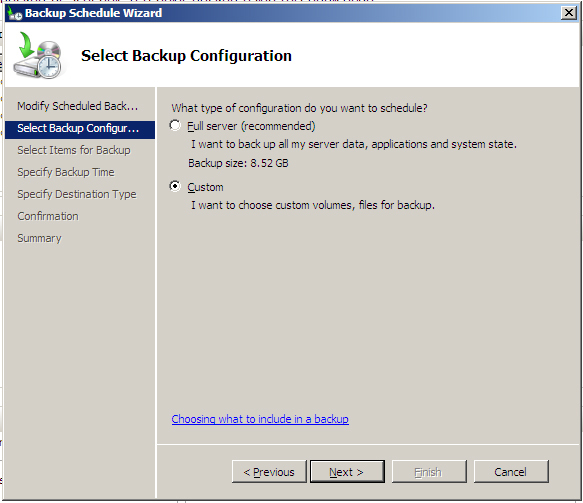 The backup wizard prompts you for the type of configuration to start a backup for. You can choose the recommended "Full Server" option, which includes all hard disk volumes and critical data required for a recovery, or you can choose the "Custom" option. Selecting "Custom" allows you to specify a list of files and folders to include in the backup, using a standard Windows Explorer view. Unfortunately, a Scheduled Backup job only permits one job to be configured at a time; you cannot configure multiple jobs to backup different data at different times, for example. This task still needs to be done using the Command Line Tools/Powershell cmdlets and Task Scheduler. The ability to take a System State backup using the GUI has now been added - this was only available via the Command Line in the original release. This is selected as an item after picking the "Custom" option in the backup wizard. System State backups are useful backups to have; they contain a copy of all the critical system files and of any Active Directory database information. For Administrators of Domain Controller (DC) servers, this option allows you to take a backup of all the critical files needed to recover Active Directory in an emergency, without delving into scripting your backup jobs. Also added for the System State is the ability to take a backup via the Command Line or the GUI to a remote network share. The command wbadmin start systemstatebackup -backupTarget:\\server\share will no longer fail but actually proceed to create a backup of the server to the remote file share. The installation of Windows Server 2008 R2 (or a Windows 7 client, incidentally) automatically creates a reserved partition - the "System Reserved" partition - which is usually just a few hundred megabytes in size. This partition contains the Windows Recovery Environment (WinRE), and can be used to boot the server in the event the Operating System becomes corrupt or otherwise fails to boot. 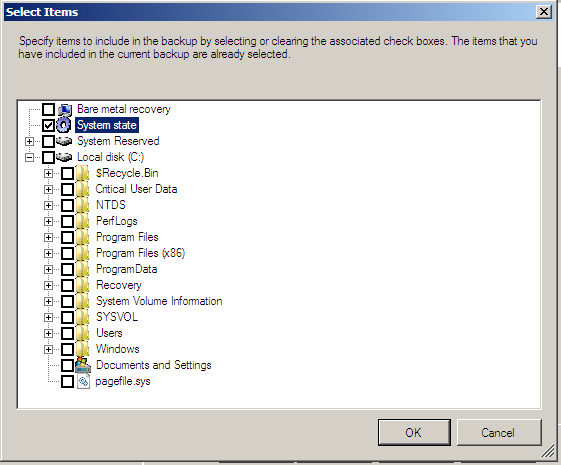 In the previous file selection screenshots, you will notice there is a new option - "Bare Metal Recovery" - which can be selected as a type of backup. This option is very similar to the -allCritical command on most Windows Server Backup Command Line tools in both the original and the R2 release, and akin to the ASR option in NTBackup. A Bare Metal Recovery takes a copy of all the files needed to recover the whole server to its state at the time of backup, including most of its configuration. This type of backup is sure to get your server running again in the event of a disaster, although it isn't guaranteed to include any of your critical data. If you do a "Custom" backup job, ensure you include the "Bare Metal Recovery" option as well as a backup of your important files and network shares. Although Windows Server Backup R2 is not perfect, it continues to satisfy the requirements of smaller businesses who cannot or do not wish to invest in enterprise products. The recent enhancements discussed here can form a valuable backup plan for small businesses. For the enterprise customer, or someone wishing to backup large amounts of data from multiple servers, Symantec Backup Exec, Acronis TrueImage or Microsoft System Center Data Protection Manager are much better choices for giving more control over backups and allow tape-based backups. However, for low levels of data and single server deployments, Windows Server Backup continues to impress with a wealth of new features in this latest release. Comments are welcome. Thanks for reading.